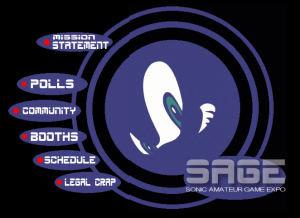 Sonic Amateur Games Expo (SAGE) is a yearly online event for Sonic the Hedgehog fangame developers to chat online and to demonstrate finished and unfinished games they are developing. Started in 2000 by community enigma BlazeHedgehog, the premise of the event was to expand the appeal of fangaming, which is still even today viewed as a sort of taboo given inherent copyright problems. There have been 14 SAGE events to date, which originally took place biannually until the 10th iteration in 2005, where the format changed to the annual SAGE known today. The original Sonic Amateur Games Expo website. As the original Sonic Amateur Games Expo, Blaze Hedgehog set out to make a showcase for the Sonic fan gaming scene, setting the template for every SAGE thereafter. He wanted to feature fan games in the same style and presentation as the Electronic Entertainment Expo in the form of "booths," and encouraging even the use of "booth babes" for each booth. The event lasted from September 9 to September 12, and had a small attendance compared to the later incarnations of the expo. SAGE 2005, sometimes jokingly referred to as SAGE "X", marked the first annual SAGE, breaking the previously set tradition of SAGE being held biannually. Directed by Gamerdude and Smidge204, SAGE 2005 sported a nifty, slick layout and had a host of wonderful projects on display. SAGE 2005 also marked the event's first guest interview. Ben Hurst, one of the writers for the TV series Sonic the Hedgehog, was interviewed under proctored settings in SAGE's IRC chatroom. Koray, the organizer of SAGE 2006, had been suffering from issues in life that resulted in him disappearing without a word months leading up to the event. Smidge204, the administrator of SFGHQ, took up the mantle of quickly throwing together an event after it became apparent that Koray wasn't going to show. The event itself rehashed the minimalistic, slick layout from SAGE 2005 and did a decent job of holding up to its predecessor. Ben Hurst returned for another interview with the community. Joining him was the current writer for the Sonic the Hedgehog comic book series by Archie, Ian Flynn. Interest in revamping the SAGEcast was introduced during SAGE 2006 when DimensionWarped, Slingerland, and Shadix attempted to broadcast a prerecorded multicast via Skype. Due to technical difficulties Shadix did not appear in the final broadcast; however, the broadcast went to show that SAGEcasts could have more meaningful content. SAGE 2007, directed by Slingerland, renewed interest in the event after a disappointing 2006. His SAGE went with a simple and quirky thematic layout that would change on each day of the event. The themes revolved around countries, each with a themed piece of Sonic character art. Slingerland's dashing charisma and publicity attempts brought about a huge boost in audience. Ryan Drummond became the first guest appearance in relation to the official games, and his appearance garnered a huge amount of attention from Sonic communities all around. Ian Flynn also reappeared to discuss more regarding the Sonic the Hedgehog Archie comic book series. SAGE 2007 introduced a more entertaining side of SAGE. Cool events featured Slingerland's epic skits, like "Saturday Nights' Main Event," "Sonic 2 Epic-pella," and the "SAGE Report." Community members held workshops to share their talents, most notably Tweaker with his ROM hacking workshop. Live multicasts were a regular occurrence and even spawned a karaoke show. Contest wise, there was a level design competition, an art competition, and a video submission contest. SAGE 2008 set out to expand on the new standard set in 2007, with a trend towards more entertainment. Hosted by Shadix and MarkEchidna, the idea was to draw the casual audience in through entertainment, interviews, and exciting content to promote booths. It was held from August 17 to August 24 (eight days to commemorate it being 2008). The SAGE 2008 site was over-the-top and flashy, featuring detailed informative pages and a coverflow-esque booths page that was somewhat clunky. Unlike in previous years, SAGE 2008 was more organized from day one, with most booths working at the beginning of the event. SAGE 2008 had a large guest lineup, including Christian Senn, Richard Wheeler, Howard Drossin, Richard Jacques, Jun Senoue, Lee Brotherton, Ryan Drummond, Mike Pollock, and Eric Iwasaki of ND Games. Events at SAGE 2008 included Shadowgoten & Duckboy's Opening Extravaganza, SAGE Idol, the SAGE Trivia Gameshow featuring Mike Pollock, DOM's Live Videogame Music Show, Dramatic Fanfic Readings with ANDROSS, and OCRemix Interview with Special ORMGAS\BEATDROP FM Combo block. While the entertainment was obviously there, the fangames were overshadowed and ignored. This issue drew criticism from many SFGHQ members. Sonic Amateur Games Expo 14's website. SAGE 14 was held in 2009 from July 25 through July 31 and hosted by InstantSonic and Hero Chao. It has been widely regarded as one of the best iterations of SAGE to date, bringing most, if not all Sonic fan communities together. It was geared more towards the fans and the fan games themselves rather than how many ratings each fan game received. The website was designed and created by Hero Chao, who also created and managed the event schedule and booths, and was responsible for obtaining the special guests of the event. InstantSonic directed the events, fan game booths and the SAGEcast. ROM hacks were also included as booths for the first time. A requirement for obtaining a spot in the SAGE booths section was that an individual must have a fan game to present. Even with this requirement, SAGE 14 featured 42 fan games/booths during the week-long exposition, the largest number at any SAGE event so far. SAGE 14 was extended for an additional unscheduled week. The IRC chat was moved to a channel called #sagexpoafterparty, allowing those who enjoyed SAGE to wind down and talk about what had occurred the week before. Really Amateur Games Expo 3's website. The Really Amateur Games Expo, created by Slingerland took place during SAGE 14 and was the third RAGE since it began in 2007. 2009's RAGE held a 5 day competition during SAGE which involved making the worse Sonic fan game possible with Klik & Play, although it was not required to enter a booth into the RAGE. SAGE 2010 took place from August 8th to August 17th. Similar to SAGE 14, InstantSonic and Hero Chao, along with ila organised this event. Last year, there were interviews with SEGA PR member RubyEclipse and the voice actor of Tails in Sonic Adventure, Corey Bringas. In addition, the events were the Write Your Own Sonic Tune Contest, Sonic Theme Song Parody Contest, Write as TSSZ for a Day and the Eggman Voice-Off with Mike Pollock as well as radio streaming including fanfic readings, music hours and The Ken Balough Show, where Moonshadow Caz reviewed a few SAGE games as Ken Balough. The Really Amateur Games Expo, created by Slingerland took place during SAGE 2010 and was the fourth RAGE since it began in 2007. 2010's RAGE held a 5 day competition during SAGE which involved making the worst Sonic fan game possible with a post-apocalyptic setting. SAGE 2011 was run rather later than usual with the event taking place during September 18th - 24th. Organised by Shadix, notable events included an interview with Naoto Oshima; a 3D animation panel by the character animator of Sonic Rivals 2, Nate Horsfall; the obligatory annual appearance by Mike Pollock and the live results of the 2011 Sonic Hacking Contest among other things. SAGE 2011 was also plagued by management disasters, however, Tobin and Tongara stepped up to provide much needed technical assistance and a lot of dark humor respectivly. With their last minute assistance SAGE 2011 managed to mostly overcome a lack organization and planning in the first day of the event. SAGE 2012 took place from Aug. 6 - Aug. 12. It was hosted by Tobin and Tongara. This page was last edited on 14 April 2018, at 23:24.